July 24, 1943 —The Grand Fascist Council votes no-confidence in Mussolini after the Allied invasion of Sicily. Mussolini is then deposed and arrested. Sept. 3, 1943 —The new Italian government under marshal Pietro Badoglio signs an armistice with the Allies in Allied-occupied Sicily. Sept. 8, 1943 —Italy surrenders to the Allies. One of the conditions is that Italy now declare war against Germany, still in control of most of Italy. Sept. 9, 1943 —The Allies invade at Salerno and start their drive north. Sept.12, 1943 —A daring German paratrooper raid rescues Mussolini from his captors. Sept.23, 1943 —A Fascist state termed the Repubblica Sociale Italiana (popularly known as the Repubblica di Salò—after a town on Lake Garda) is set up by the Germans in that area of northern and central Italy under their control. Mussolini is installed as head of state. It is essentially a puppet state of Nazi Germany and lasts until the Germans leave Italy altogether in late April of 1945. The article below uses both terms: "Social Republic" and "The Republic of Salò." Also, the article makes reference to “Fascist partisans” in the south; that is, forces still loyal to Mussolini and Fascism in spite of the official surrender of Italy to the Allies. I have added a few other editorial explanations in the body of the text. They are [bracketed like this]. This article appeared in the Oct. 29, 1969 issue of the Italian weekly news and feature magazine, Gente. The photo of the four conspirators reproduced directly below ran with the original article. The translation is my own. Sorrento, October— In the spring of 1944, while Italy was divided in two and the Allies and the Germans were faced off at Cassino, an organization of “Fascist partisans” under the command of prince Valerio Pignatelli was formed in the province of Naples. By and large, they had almost no time to act since the organization was discovered and the members arrested; the nucleus group, headed by a former Fascist inspector, Stelio Sguanci [on far left in photo], had its center at Massalubrense on the Sorrentine peninsula. Sguanci’s “partisans,” in theory, were prepared to do anything; their main goal was to take the battery of 88 mm artillery pieces [note: the "eighty-eight" was captured German artillery] that the Allies had set up over the Capri strait, the only access to the port of Naples, since the other access, the waters between the island of Capri and the island of Ischia were heavily mined. How and why the planned Fascist reconquest of the Gulf of Naples remained nothing more than a mad dream is an untold story. Indeed, the whole story of Fascism in the south in the latter part of the war is a totally unexplored chapter and one full of surprises for whoever takes the time to look into it. We can recount one episode, however, that at least so far has not yet been reported. This is what happened. 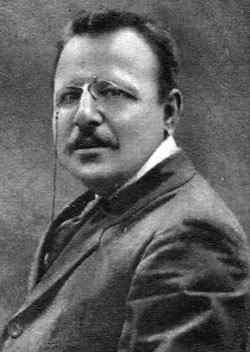 As is well-known, the philosopher, Giovanni Gentile, the best-known and most illustrious “person of culture” to support the Republic of Salò, was killed by an anti-Fascist partisan in Florence on April 15, 1944. The event stirred up a great clamor in both parts of divided Italy but did not cause an immediate reaction on the part of the Fascists even though they had just lost their most prestigious supporter, both nationally and internationally. We can now reveal that there was indeed a plan to “get even”; it was hatched by Fascist partisans operating in Massalubrense, a small town just a few kilometers from Sorrento, where the anti-Fascist philosopher and Gentile’s former good friend, Benedetto Croce, was living undisturbed. In short, the Massalubrense Fascists had the idea to kidnap Croce and stash him in an isolated quarry on the coast until a German submarine could pick him up and transport him north to the “Social Republic”. The point was to force Croce to go on the air and publicly pay tribute to Gentile. This is how it was supposed to unfold, according to Stelio Sguanci, the current town clerk for Sorrento, the person who came up with the idea in the first place. He says: “I was born in Peretola, a Red stronghold, son of an anti-Fascist who was a cellmate of Gaetano Salvemini [note: a noted Italian academic and politician, founder in 1925 of the first clandestine anti-Mussolini journal] in jail in Florence. In 1929 my father was forced to leave Florence and move to Sorrento, where he was, among other things, a gardener at the Villa Tritone, a splendid building where Benedetto Croce went to live after he left Naples to get away from the bombings. I mention this to show you that I was very familiar with the grounds of the villa and that it wouldn’t have been very difficult for me to get in there and grab their famous house-guest. Also, the fact that I was from Florence might indicate why I wanted to get revenge for Gentile. I wanted to show my fellow citizens of Florence that they had stained themselves with a crime with absolutely no excuse. 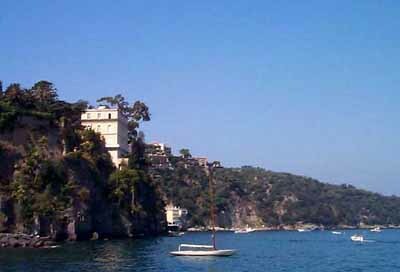 “We Fascists in Sorrento had always respected Benedetto Croce even though he was our sworn enemy. It was logical, we thought, that anti-Fascists would have shown the same respect towards Gentile. It didn’t turn out that way, and I just felt that we had to answer them in some way. I spoke to Nando di Nardo about it; he was the one who maintained our contacts with the north. “Di Nardo, currently a deputy of the MSI party [note: Movimento Sociale Italiano: a right-wing Italian political party at the time this article was written], often came to visit us in Massalubrense. We had a meeting in some woods and worked out our plan of action. He approved of my plan but said we should wait because he wanted to make sure that the north in fact was ready to send a German submarine to pick up Croce after the kidnapping and take him back to the Social Republic. My plan was simple: some friends from the Massalubrense group and I would break into the villa during the night and get him. It wasn’t even guarded. We’d bundle Croce into a stolen car and throw pursuers off our tracks by heading out in the direction of Castellammare and then doubling back a few kilometers later at Meta by turning off to the right on the road that goes to Positano. We’d get up to the Fontanelle pass, get out of the car and then make our way back on foot through a heavily wooded area where there are no roads. To cover our tracks, the car and driver would keep going towards Positano and at a certain point the driver would just dump the car into the sea from one of the many curves and steep cliffs. In the meantime we’d have made our way along a path through an uninhabited area to the area called Le Tore approximately where they have just recently built the Sorrento heliport. “At that point, we’d move away from the side of the peninsula that faces the Gulf of Naples and over onto the Gulf of Salerno side, move past a small fishing and faming village named Torca and come out at the harbor of Crapolla. Calculating the nighttime hike through the thick woods, it would have taken about two hours to get there. “Crapolla is an inlet pretty much isolated from the rest of the world (where, they say, St. Peter docked when he reached Italy). There, a boat would have been waiting for us, with Cataldo Massa on board, one of the Massa Lubrense group. He was to ferry us to the Ieranto quarry further over on the coast where we would hold Croce until the arrival of the submarine. It’s a large quarry dug into the rock face at water’s edge almost at the tip of the Sorrentine peninsula, but on the side facing the Gulf of Salerno. It was in use until September of 1943. There were about 200 miners at work there, quarrying rock for the Italian steel works. The quarry belonged to ILVA [note: name of the largest Italian steel producer at the time] and boats from two to six-thousand tons ran in and out all the time to supply valuable minerals to the steel industry. A large silo was built right onto the steep cliff to facilitate loading. 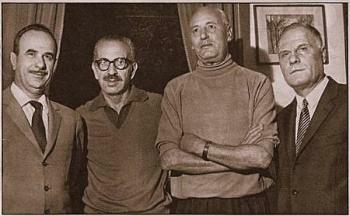 Stelio Sguanci’s narrative has been confirmed point by point by three of his closest collaborators in the group of ‘Fascist partisans’ of Massalubrense: Vittorio Marcia [on far right, photo at top], Domenco Zarrella [second from left], and Cataldo Massa [second from right]. With Sguanci as our guide, we followed, physically, the entire planned escape route from Sorrento to the Ieranto quarry. Today a panoramic road passes through the hills above Sorrento, but it is still possible to move at night unseen through the countryside leading away from the Fontanelle di Torca. From Crapolla to the Ieranto quarry, there are no surprises, especially after Marina del Cantone, which has been assaulted by tourism. The countryside is worthy of Dante’s Inferno: very steep cliff faces, no real roads, kilometers of arid hills, and here and there furrowed goat trails. We reached the quarry by motor boat, disembarked, looked around and were immediately convinced that this would be the perfect place to hide someone, especially if he were to be guarded by someone who really knew all the natural hiding places in the area. Food wouldn’t be much of a problem even in the case of a longer stay; there was always the sea.